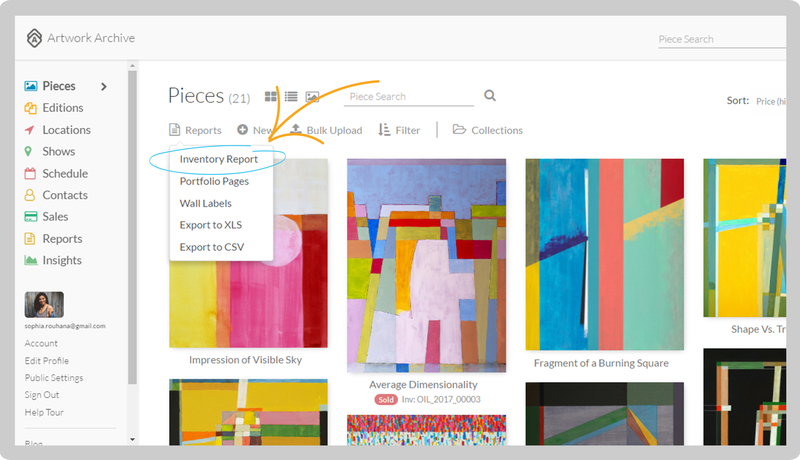 Generate a list of your Pieces with all the detail you want included. Why create an Inventory Report? For Artists: This is a great report to present to galleries and art dealers who want to see your available inventory. For Collectors: This is a great report to give to your insurance company so they have a record of your Pieces and their value. Click Pieces in the left-side menu. Click the gray Reports button and select Inventory Report. Select the information you would like to include. Select the information you would like to include in the Report, including Report Options, Contact Info, Report Design (such as fonts and including a Header Image), Data Options, the chance to include links to the original high-resolution image files, and more. Then, select which Pieces you would like to include. 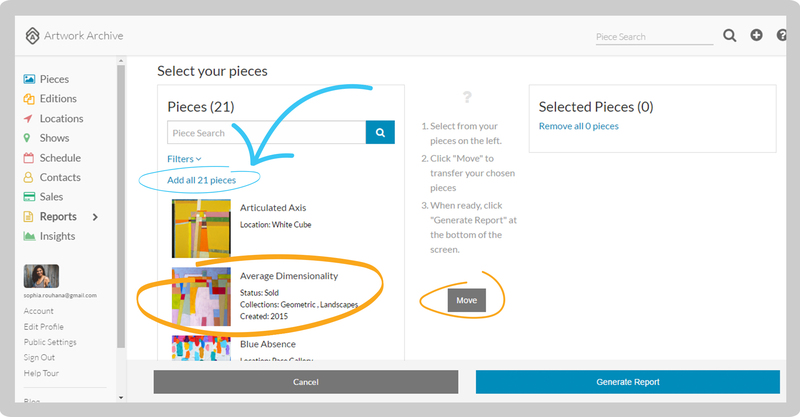 You can click Add all # pieces to include your entire Inventory, or click on which Pieces you would like to include and select Move. Note: You may also click on any Pieces in the Selected Pieces column and click Move to remove them from the Inventory Report. Then click the blue Generate Report button. Your Report will be generated as a PDF file and fully downloadable in Reports. Once your Report has finished uploading, click on it in the Report column and choose from the drop-down menu to either View, Download, Copy URL, or Share. You may also edit your Report by clicking on the blue Pencil icon on the right-hand side. Looking for more? Watch this video.